The sensibilities of the new Viking Star will be especially appealing to over-50 travelers. “We like to do things differently,” said Torstein Hagen, founder and Chairman of Viking Cruise Lines, speaking to a group of travel agents and travel journalists shortly after the Viking Star set sail for the first time to its new winter home in the Caribbean. While the differences between the Viking Star and other mid-size ocean-going vessels in its class aren’t revolutionary, the Star–and her sister ship, the Viking Sea–have a distinct ambiance and personality that will be especially appealing to boomer travelers. We spent several days onboard the Star as it sailed from New York City to Puerto Rico. While we didn’t have the opportunity to experience port stops and shore excursions, we did get a good sense of life onboard during the course of four sea days. The serene onboard environment is unmistakably designed for adults. Viking Ocean Cruises are specifically advertised for and geared to the over-55 market, the same group that has been attracted to Viking River Cruises. In fact, children younger than 16 years of age are not permitted on board. Call me vain—but there is something comforting about relaxing in the sauna or swim pool, and recognizing you are among your age peers. It is also easy to strike up conversations with people who share the same generational experiences. The décor and color palate of the ship also appeals to our sensibilities. It is comprised of calming blues, beiges and light Norwegian woods. Design-wise, there is always a quiet spot to sit and relax, or to chat with fellow travelers. Guests don’t have to belly up to a crowded bar for a drink or coffee; when they take a seat, crew seeks them out to for their order. The program of enrichment and excursion talks during the day is geared to intellectually curious travelers of a certain age. Viking Ocean Cruises showcases its finest culinary offerings in their main dining room, called The Restaurant, where passengers have most of their meals. This is a departure from most cruise lines that feature “their best” at smaller, specialty restaurants, often with a surcharge. “If we serve something, we do to right. If we can’t, we don’t do it,” Chef Anthony Mauboussin, Director of Culinary Development for Viking Cruises, explained on our cruise. The menus feature fresh fish and shellfish; even the lobsters are kept alive onboard before they are served. Prime quality meat is sourced from a dedicated supplier. Hamburgers are made using 40-day aged prime beef. 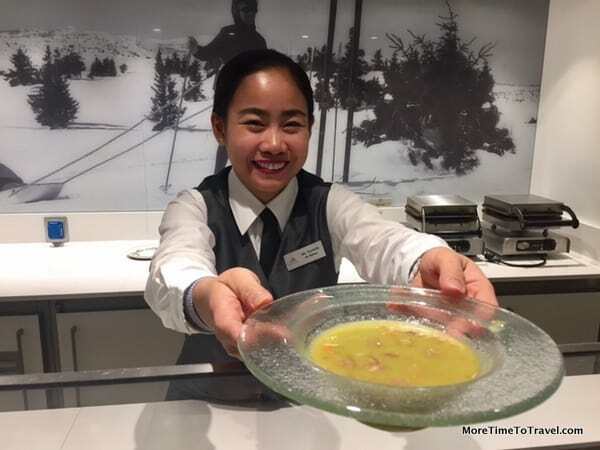 When guests want to serve themselves, they can eat the exact same foods as that served in The Restaurant at the World Café, an attractive and spacious buffet with multiple stations. The only difference: service and setting. The line has reconceptualized its smaller venues as “alternative” rather than specialty restaurants. One of them, The Chef’s Table, offers a fixed multi-course tasting menu. When we were on the ship, it featured the regional food of Xiang, China. The other, Manfredi’s, is Italian-themed, a perennial food favorite with travelers. Each alternative restaurant seats 120 persons; reservations need to be made in advance. By doing away with a casino and implementing other design innovations, the ship’s architects have increased the square footage available for public spaces. There is always ample room (and seating) in the two-story atrium Living Room and the light-filled lounges. The Explorer’s Lounge on Decks 7 and 8 at the bow of the boat offer unobstructed views of the ocean from comfortable armchairs. While you won’t find climbing walls or discos, you will discover enticing nooks, crannies and libraries. We noticed that large areas are skillfully broken up into smaller dining and conversation areas through the clever use of wall dividers and bookshelves. When Chairman Hagen spoke, he explained how the line’s river cruising experience has influenced its expansion. The ocean-going vessels incorporate many recommendations from the line’s river cruisers (approximately 479,000 passengers each year). Moreover, small-ship efficiencies garnered from the river ships have migrated to the ocean-going vessels, resulting in costs that are highly competitive with other mid-size ships. Passengers who’ve been on Viking river ships will notice little things reminiscent of their past experiences like the heated tile bathroom floors and user-friendly shower controls. On a broader level, because the same architect designed both the river and ocean vessels, guests will appreciate the same simple, straightforward design: tasteful and elegant but devoid of glitz. There are no formal nights. Rather, the dress code during the evening is “casual elegant” although it leaves room for individuals preferences, especially in the more casual buffet restaurant. With the roots of Viking Cruises being Norwegian, it shouldn’t be surprising that there is a Scandinavian influence throughout the vessel. Mamsen’s is a small deli counter in the Explorer’s Lounge, named after Hagen’s mother, where guests can enjoy authentic snacks from her cookbook. These include made-to-order waffles with fresh berries, Norwegian goat cheese and chocolate sauce. Also delectable are open-faced sandwiches, such as Atlantic shrimp on white bread, beef tartare on rye bread, and cured salmon on dark bread. Mamsen’s pea soup is served each night between 10PM and midnight. Throughout the ship, the collection of curated art showcases works by Scandinavian artists. Especially appealing is the huge digital art display in the Atrium lobby. Viking has licensed the digital rights to the entire Munch Museum in Oslo, Norway. Different paintings and lithographs by Edvard Munch rotate across the screen each evening, set to live music. There are no stuffy butlers or charges for self-service laundry. Instead, the design and décor of the Viking Star feel down-to-earth, welcoming and homelike. But it is the friendliness and warmth of its crew that sets the vessel apart. “Making people feel comfortable is luxury to me,” says Hagen. While he admits that Viking Ocean vessels may not suit everyone, these mid-size ships are a perfect fit for over-50 travelers with upscale but no-frills tastes. There is so many good remedies for people who get motion sick these days. You shouldn’t miss out on the wonderful world of cruising! We just cruised on the “Viking Star” from Stockholm to Bergen — and found it wonderful. You’ve hit on many of the features that would appeal to over-50 travelers. We especially liked that there was no casino. But there were many thought-provoking guest lectures (and the recorded TED lectures were fascinating too). The free thermal spa was a pleasure and became our go-to ritual before dinner. But we never seemed to stay up late enough to try that pea soup you talk about in Mamsen’s :-). What a lovely review. We enjoyed our Viking River cruise, and I am looking forward to trying one of their ocean cruises – hopefully soon! One of the nicest things about my first Viking River Cruise was meeting you, Faye! A thorough and thoughtful review, Irene. I had not heard of Viking Ocean cruises — they sound delightful. With new ships and routes being launched, I’m sure you’ll be hearing more! I love how Viking Ocean Cruises has created an experience that suits the over 50 traveler. From your photos it appears as though it is well-illuminated – another good feature for Boomer travellers. Dimly lit public spaces are a prime cause of accidents among many older travellers. We’ve enjoyed the Viking service on their river cruises in the past and have been looking forward to the ocean cruises – this whetted my appetite perfectly! Thanks for sharing! No doubt you would love it! Thx so much for this post, Irene. The Viking Star definitely looks like my kind of ship. I love the relaxed atmosphere, age specific marketing, and removal of the casino. Definitely sounds like I need to check out one of the Viking Ocean Cruises. I did the Viking Homelands cruise on the Viking Star this past summer and it was wonderful for all of the reasons you describe and more. I really appreciated the nice fitness center on days at sea. The Restaurant was a delight but as always it was the staff who made the whole experience so memorable.Viking really knows how to do it right. Such wonderful attention to details, service and aesthetic, I think this type of cruise is something I need to do someday and also share with my audience base. Sounds like the type of cruise I would enjoy very much. Of course, I am over 50. I’ve heard very good things about Viking although I’ve never sailed with them myself yet. They have a reputation for doing things right. The perfect target audience and a cruise that sounds right up my alley, Irene! You might be vain (me too :)) but there’s nothing more disheartening that finding yourself in a pool of firm-bodied 20 year olds! I also don’t like discos or a bar-scene filled with party hearty millenials! (Now I’m sounding crotchety!) What I do like, from your description, is the 2 story atrium and light-filled areas tucked away where you can watch the ocean for hours, the casual elegant attire and of course, the service and attention to detail. A cruise on Viking is high up on our list of things to do! I like the way Viking targets an older audience without feeling old and tired. They’ve done a terrific job identifying that the over 50 demo is still quite active, loves to travel and more importantly wants to keep learning. The food choices on the Viking ocean cruises sure seem much better than your typical large scale ships. Would love to check it out! OK, sign me up! Yes, there is something so civil about this cruise line. Love how it is catering to the 50+ crowd and our preferences. Love the open areas and libraries and lack of glitz. I’m over that! Definitely feels like a comfort zone! We were aboard the Viking Star last summer in the Baltic and loved it. Couldn’t agree more with your take on the ship and its services, they are perfect for travelers that are more concerned with seeing destinations while still enjoying a high level of quality and service. Glad to hear that you had such a great experience, too! Glad to see the resurgence of the ocean liner instead of simply more floating mega malls. No disco or casino, but libraries and art instead! Sounds like a winning combination to me. Thanks for your article about the Viking Ocean Cruises Star cruise ship and its focus on over-50 travelers. Not permitting children under 16 to set food onboard seems like a good start. You make no reference to the music piped onboard either in public areas or in the bars and restaurants, so I hope that means that there is no loud, rap or beat music to have to bear with. Thanks for a very informative article! Love this – Metal kitchen cookware art in the World Cafe on the Viking Star is just brilliant. Creative artwork is the best!